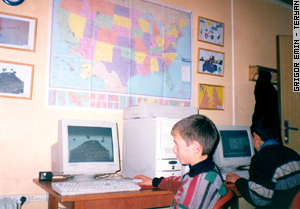 After study at the University of Missouri and University of Illinois in the United States, Anush established SpiTux School, a center where children learn computer skills. Upon graduating Yeveran State University, Anush won a Muskie Fellowship and took a year's post-graduate study in economics. She returned to Armenia in 1995 and returned, too, to work in a summer camp held each year in Spitak, organized by the Armenian Student Brigade, which Anush had helped run two previous years. In that same year she was accepted for study at the University of Illinois, one of the top institutions in the States in the field of Computer Science. Anush got a Master's degree in computer science and followed it with a PhD in mathemetics, giving lectures at the university to earn money for the doctoral program. It was there, too, she met and married Steve Shepherd. Upon completion of her PhD, Anush worked at Stratus Technologies computer company in Boston. The job provided a good living, which allowed her to fulfill her wish of helping the youth of Spitak. Last summer she quit her job, bought seven computers, network equipment, a laser printer a digital camera and other media equipment and moved back to Armenia to open the training center, in the heart of the earthquake zone. 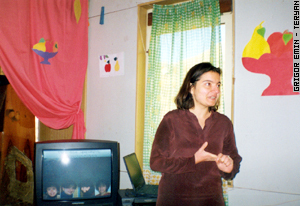 Shogher Amirkhanyan gave Anush space in the Shogher Children and Youth Center and gave Anush a place to live in her home and now the two-room laboratory is teaching children (and some adults) computer skills including website design, programming, animation and computer graphics. The center also publishes a children's newspaper. The 30-year old professional is modest about her ambitous and bold move. "I decided to create an amazing working place for myself, not grabbing someone else's work," she says. "There was no such a person who would like to be engaged with a work exactly like this." Anush also gives free lectures to the magistrates at Yerevan State University, in the Applied Mathematics faculty. "There already are lecturers at the university and they lecture well," she says. "But they are people who support family. At this moment I could afford not to work somewhere where there is salary." On November 29 SpiTux School (http://SpiTux.home.att.net) held its official opening, after having been in session since October 1. Pupils, their parents, lecturers from Yerevan's higher educational institutions, leaders of public organizations and Lori region's governor Henrik Kochinyan expressed their gratitude towards Anush. The department head of YSU Semyon Nigiyan said: "It seemed to us that benefactors should be very rich. But it turns out that it is enough to have a rich soul."